As elections can sometimes do, this one brings out the worst in people; dirty secrets are posted on the council website by anonymous sources close to the candidates, damaging the reputations of formerly respectable residents of the town. At the center of the battle is the issue of The Fields, a council estate (similar to American projects) that has been forced under Pagford’s jurisdiction, and the Bellchapel addiction treatment center used by many Fields residents. Having grown up in The Fields and gone on to prosper, Barry was an advocate for keeping The Fields under Pagford’s jurisdiction. However, others view the estate as a blight to their village and want to foist the responsibility for it back onto their neighboring town; they don’t want to pay for the upkeep of the housing project, and they don’t want children from unstable dregs-of-society families tainting their comfortably middle class schools. I feel like Rowling took on a lot with this novel. She tackles the weighty topic of government aid for the poor and the responsibility citizens have for supporting those who are down and out. Although some of the smug middle-class characters see The Fields and the addiction center as drains on town, others recognize the integration as necessary for helping those born into destitution make more of their lives. Barry, for example, was able to leave The Fields and build a better life for himself because the estate being under Pagford’s jurisdiction allowed him to enroll in the quality Pagford school system. Similarly, a social worker recognizes that the Bellchapel addiction clinic is the only thing enabling one woman to gain a tenuous hold on sobriety, develop a measure of control over her life, and keep her family together. It’s a weighty topic, but I think Rowling makes a good argument for supporting the fallen members of society. There were a few things I didn’t like about this book. For one thing, there were A LOT of characters. At one point, I got so confused trying to remember who was who and what their relationships were that I made a reference list of all of the characters with notes connecting the different families and individuals. There are 32 characters on that list, about 20 of whom are vital to the story. I understand that Rowling is trying to represent the many facets and complex social strata of this town, but it gets to be a bit much. (That said, when I think about it, I can’t come up with any characters that should be cut from the story; each of them are vital to telling the story of this town.) It doesn’t help that most of the characters are such horrible people. Krystal, a crass member of Barry’s crew team and the daughter of an addict in the Fields, is really the only one who ever tugged at my heartstrings. However, I did like how the novel comes full circle. Barry Fairbrother’s death at the beginning causes the town to break out in warfare; children broadcast their parents’ secrets, wives betray husbands, and everyone is miserable and mean. It takes the tragic deaths of two young people at the end of the book to make people step back, recognize their follies, and reevaluate their prejudices. The first death is the catalyst for strife, dividing the town, and the two later deaths help reunite the warring sides and restore balance. Although tragic, it has a nice symmetry. Overall, I liked this book, but I didn’t love it. 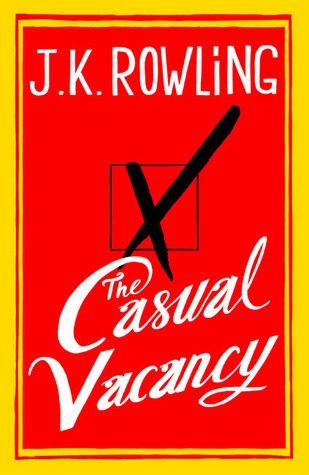 It is ambitious and certainly shows that J.K. Rowling can write a deeply complex story for adults, but most of the characters are so toxic that it was hard for me to enjoy reading about them. I think this is a very good book, but it’s just not the type that I tend to enjoy reading. Can’t wait to read it when I’m done! I look forward to hearing your thoughts once you’ve finished! I really liked this book. It’s obvious that Rowling is a great writer, being able to write a young adult series, then switch so well to adult fiction. The characters left a lot to be desired, but they’re human–I liked that she wrote them with all of their human issues and hypocrisy. And I really like that the ending isn’t all “happily ever after.” It’s more like real life. I also liked that the characters were so human with all of their flaws, but I would have liked to see some more positive elements or dimensions. For example, I wanted to know why Simon is so nasty and what good qualities made Ruth fall in love with him so many years earlier. I also liked the ending; it was realistic in that it wasn’t all sunshine and roses, but there were notes of hope. I also felt more like you, Leah, than like Heather. I know that Heather (and lots of other readers) loved this book, but I ended up feeling like it was good but not fabulous. I don’t always like a “happy” ending (so cliche) but I just didn’t think that this book was as much my type of book as many others could be. I do give her a ton of credit for taking on such a big topic and stepping outside of what we feel is her comfort zone. I think that this is quite a good book, but like you, it wasn’t quite up my alley. I admire what she did, but it wasn’t exactly my idea of an enjoyable read. Yes! I do think it was very brave of her to try something so completely different than what she is famous for — then again, I suppose that whatever she writes is going to be compared to Harry Potter, so why not write something as different as possible? I kind of think that’s what she did. I think that everyone has multiple pieces of their personalities and that she’s showing us another side. For instance, I have been an elementary school teacher but I love to watch MSNBC’s Lockup (jail show) on TV and crappy reality TV is my vice. Those are all different sides of me, and I show pieces at different times, just like J.K. did with her new book, in my opinion. Now that i read it, I can finally comment. Yay! I enjoyed the book, it very much remminded me of a social version of Franzen’s “Freedom”: a realistic description of a reality we are in touch with but, sometimes, do not pay attention enough to criticize it. Regarding the characters, I drew family tress from page 20. I have this irrational fear of getting lost among the characters. I liked it, I like that Rowling was able to shift from children’s values and stories to more adult topics and to do so successfully. It shows she’s a good writer. Woohoo! I haven’t read “Freedom,” but I have “The Corrections” waiting on my shelf. So many characters! I have a terrible memory and often forget who characters in much simpler stories; taking notes was so necessary for keeping them straight! Definitely! And her characters are just as dynamic and complex in this book as in Harry Potter, which really impressed me.